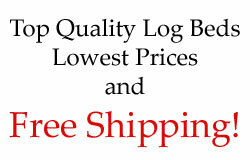 Add warmth and charm to your home or retreat with a cedar queen log bed from Cape Cod. Each bed set comes complete with headboard, footboard and side rails. Or buy just the headboard! Our beautiful Cedar Log Beds are easy to assemble. Bed dimensions are outside-to-outside, and may vary due to log size. Our untreated bare wood cedar furniture is non-toxic. If you have a loved one with allergies, multiple chemical sensitivites (MCS), or an autoimmune condition, you'll be glad to know that the cedar wood in our furniture is absolutely untreated with chemicals of any kind. Reduce toxic emissions and VOCs in your home by using our non toxic furniture as a the framework for all your home furnishing needs. Read all about our non toxic furniture.